So, Ya Wanna Be A Winemaker? 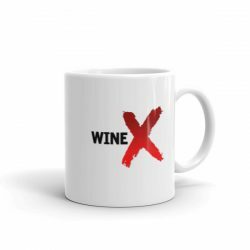 Pruning / Racking / BlendingThe cycle of making wine is like throwing a party — spring and summer are spent setting up and getting everything in order; fall’s the party itself, with its raging, nonstop, sleepless nights; in winter everyone leaves, and you have to clean up. 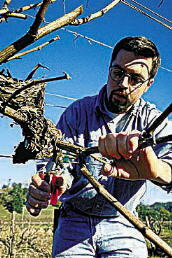 In the vineyard, this clean-up consists of pruning. 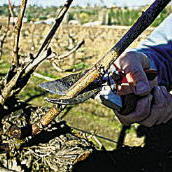 Pruning is technically defined as removing living branches of the vine to affect seasonal yield. More to the point, it means cutting off stuff on the vines we don’t need. At the end of every season we must go back in the vineyard with a pair of pruning shears and cut away 95 percent of everything that grew during the previous season. We must be careful, however. The crop we get (or, if we mess up, don’t get) next year is directly dependent on which 95 percent we cut off and which five percent we keep. 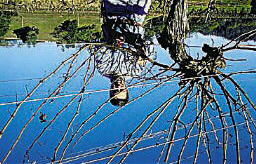 The decision is made more difficult by the fact that the amount of pruning necessary is different from one block of grapes to another. 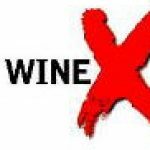 Deciding what to cut off depends on the age of the vine, fertility of the soil, the variety of the grapes, average temperature of the growing season, the type of rootstock used, the style of wine you want to make and many other cultural practices. The key to pruning is keeping the vine in balance. Leaving more buds means more fruit but, at a certain point, fruit of less quality. Leaving fewer buds means less fruit but, in general, fruit of higher quality. 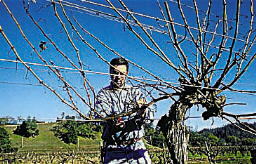 Successful pruning puts the vine in balance, so that year after year you get the largest amount of the highest quality grapes possible. In The WineryIn the winery there are two post-party clean up chores to get done — racking and blending. 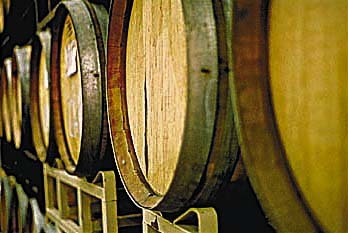 When wine’s pressed and put into barrels during crush, it’s mixed up and slightly cloudy. As the wine sits, undisturbed, it calms down (settles) and begins to clear up. Racking is the separation of the calm wine on top of the layer of dead yeast and proteins that settle to the bottom of the barrels. This layer is called the “lees.” Racking is the party equivalent of throwing out the drunk, obnoxious guy that nobody remembers inviting. The general method for racking is to unstack all the barrels and carefully pump out the top 58 gallons of wine while leaving the bottom two gallons of crap. 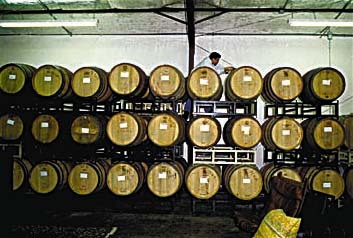 The barrels are then cleaned and the wine added back. 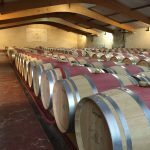 Even for a small winery like David Coffaro, this is a large undertaking, considering there’re about 130 barrels to unstack, pump, clean, fill and restack. It’s also a surprisingly large volume of lees. At about two gallons per barrel, we end up cleaning out about 260 to 300 gallons of dead yeast and protein that end up looking like thick blueberry yogurt. The final chore, and possibly one of the most important things we do, is blending. When I think of blending I can’t help but paraphrase the Six Million Dollar Man, Lee Majors: We have the technology… we can build a better wine! I honestly don’t understand the preoccupation of American winemakers with turning out 100 percent varietal wines, especially if all of the one variety is from one vineyard. What you gain in purity you loose in complexity and flavor, and I just don’t think that’s a very good trade off. I think blending provides the winemaker with an invaluable tool to make wines that’re both more consistent and more complex. At David Coffaro Winery, we’re big believers in blending. All of our reds are heavily blended. 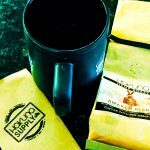 Nothing we make is more than 76 percent of any one variety. 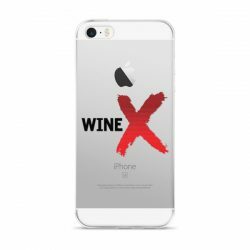 (In order to label a wine as a single variety in California, i.e. zinfandel, you must have at least 75% of that varietal in the blend.) Proper blending can be tricky, however. Blending wine is like trying to set up friends for a blind date. You know them both individually, and they seem like they’d get along great, but you never completely know until you put them together. When it works, you’ve done something magical. When it doesn’t… In this way, Dave Coffaro is a uniquely talented matchmaker.Given 130 unique barrel selections, Dave assembles seven different wines (zinfandel, petite sirah, carignane, Neighbors Cuvee, Estate Cuvee, Aca Modot (cabernet blend) and, for the first time, a dry sauvignon blanc). The sauvignon blanc is easy. We only made four barrels this year, and it’s the only white wine we make. That leaves around 126 barrels and six red wines to make. Blending with Dave is an awe-inspiring experience. He and I sample every barrel on a consistent basis over a one- to two-month period. Dave then starts building the wine in his mind: “This zinfandel barrel has good fruit and a good beginning, but no nose and no finish. This petite sirah barrel has a great nose and a great finish but no structure. This cabernet sauvignon barrel has great structure but no fruit.” Individually, they’re good — but not exceptional. 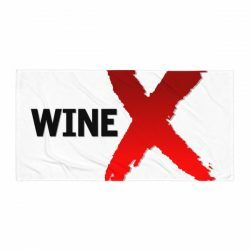 Together, they make a perfect wine — great aroma, great beginning, great middle, long finish, solid structure and yummy fruit. The best of all the components available.